Click to viewDon't roll those eyes. Unlike most Wii patent lawsuits, this one could be a little more serious. 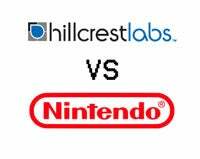 Following a complaint filed in August, the U.S. International Trade Commission have agreed to investigate claims made by Hillcrest Laboratories that the Nintendo Wii infringes on four patents they hold for motion-controlled devices. If you're interested, you can check out Hillcrest's tech here. While the ITC clearly state that this does not signal any decision on the merits of the case, it does mean their judges will be taking a good, long look at it, and if they think Hillcrest have a case to make, will kick things up a notch. For the record, goods that violate Section 337 of the Tariff Act (which is what Nintendo are being accused of by Hillcrest) can, if found guilty, be withdrawn from sale in the US, since the law was established to prevent foreign imports from infringing upon American patents. ITC INSTITUTES SECTION 337 INVESTIGATION ON CERTAIN VIDEO GAME MACHINES AND RELATED THREE-DIMENSIONAL POINTING DEVICES The U.S. International Trade Commission (ITC) has voted to institute an investigation of certain video game machines and related three-dimensional pointing devices. The products at issue in this investigation are "Wii" video game systems and accompanying remote controls. The investigation is based on a complaint filed by Hillcrest Laboratories, Inc., Rockville, MD, on August 20, 2008. The complaint alleges violations of section 337 of the Tariff Act of 1930 in the importation into the United States of certain video game machines and related three-dimensional pointing devices that infringe patents owned by Hillcrest. The complainant requests that the ITC issue an exclusion order and a cease and desist order. The ITC has identified the following as respondents in this investigation: Nintendo Co., Ltd., of Japan; and Nintendo of America, Inc., of Redmond, WA. By instituting this investigation (337-TA-658), the ITC has not yet made any decision on the merits of the case. The ITC's Chief Administrative Law Judge will assign the case to one of the ITC's five administrative law judges (ALJ), who will schedule and hold an evidentiary hearing. The ALJ will make an initial determination as to whether there is a violation of section 337; that initial determination is subject to review by the Commission. The ITC will make a final determination in the investigation at the earliest practicable time. Within 45 days after institution of the investigation, the ITC will set a target date for completing the investigation. ITC remedial orders in section 337 cases are effective when issued and become final 60 days after issuance unless disapproved for policy reasons by the U.S. Trade Representative within that 60-day period.